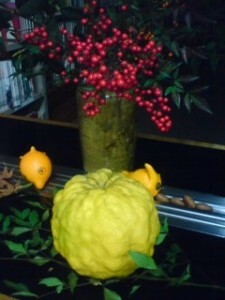 TsukuBlog | Tsukuba`s Ubiquitous Winter Citrus Fruit- The YUZU ( 柚子) – and how you can USE it! Like so many of those who live in Tsukuba`s older neighborhoods, Sumiko-San has a YUZU tree growing in her yard. In fact, she planted it herself, as a scrawny sapling, more than twenty years ago when she moved into her house in Kukizaki. The tree has long been bearing fruit, and in recent years she has been harvesting literally hundreds of orange-sized yuzu ( a type of citron) each winter. Similar sized trees can be seen growing throughout Tsukuba`s ( and the rest of Japan`s) traditional hamlets, and they bear citrons of various shapes and sizes. These range from pretty little smooth-skinned, yellow fruits ( like Sumiko`s) to bumpy-skinned giants which make wonderful objets d`art . 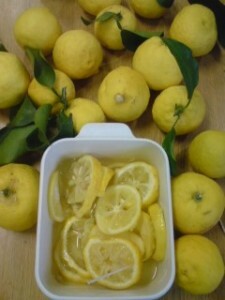 What is one to do with all these yuzu? Well, as I have explained in a previous article, these hardiest of all winter fruit ( they even grow wild in Tibet!) are put in the bath on the day of the winter solistice ( read below). As you can imagine, people with big yuzu trees, like Sumiko, put dozens into theirs. But besides use in this quaint ( and fun!) 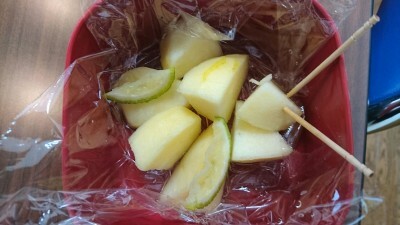 custom, these very sour fruits can also be eaten. In fact, they play a major role in Japanese cuisine are are used in everything from the simple and rustic, to the most refined dishes ( read this article from the New York Times- http://www.nytimes.com/2003/12/03/dining/03YUZU.html?ex=1385787600&en=503d5cd5111f4124&ei=5007&partner=USERLAND ). Since people like Sumiko have so many surplus yuzu, they often give them away in abundance. I have already received a few dozen so far this winter. If you also find yourself holding a plastic bagfull of gift-yuzu, you could always use a cookbook, or on-line recipes to try and make one of the many dishes in which it is incorporated. But for those of you who are not very much into cooking, here is probably the simplest way to prepare them for eating. Slice them thinly. Sprinkle generously with sugar. Add some honey. Then, let the mixture sit in the fridge. The whole slice is eaten along with the rind. Pits can be removed before eating, or just spit out. I recommend having a couple of slices on cold winter mornings. there couldn`t be a much better eye-opening WAKER-UPPER. You can also put some slices in hot water for some yuzu tea, or just sip some of the sweet and sour juice which accumulates at the bottom of the dish- WOW- you will most certainly be energized for the remainder of the day! Mixing in a few bits of yuzu to a bunch of sliced apples or persimons adds a surprisingly delightful aroma and flavor – try it! Thanks for the yuzu post! I’m trying to learn more about this delicious fruit. I’m mainly interested in American railroad practices.